Quick overview `Wonderful and timely ... 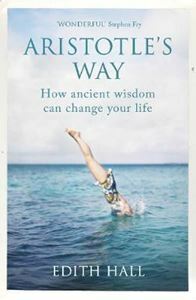 Hugely recommended' STEPHEN FRYWhat do you and an ancient philosopher have in common? Aristotle's way is not to apply rules - it's about engaging with the texture of existence, and striding purposefully towards a life well lived. Aristotle was an extraordinary thinker, perhaps the greatest in history. Yet he was preoccupied by an ordinary question: how to be happy. His deepest belief was that we can all be happy in a meaningful, sustained way - and he led by example. In this handbook to his timeless teachings, Professor Edith Hall shows how ancient thinking is precisely what we need today, even if you don't know your Odyssey from your Iliad. In ten practical lessons we come to understand more about our own characters and how to make good decisions. We learn how to do well in an interview, how to choose a partner and life-long friends, and how to face death or bereavement.